Bisphosphonates are analogues of pyrophosphate that suppress bone remodelling through inhibition of osteoclast mediated bone resorption and are widely used in the management of various metabolic bone conditions: osteoporosis, Paget’s disease, and hypercalcaemia of malignancy. Lately there has been increasing interest in the new third generation bisphosphonate, zoledronate, which is currently the most potent of its class available (10 000 times more potent than etidronate and 100 times more than pamidronate1). Zoledronate appears to be better than pamidronate in the treatment of cancer related hypercalcaemia,2 and a recent study in postmenopausal women with low bone mineral density (BMD) demonstrated improvements in BMD and suppression of bone turnover lasting for up to one year after a single 4 mg infusion.3 We now wish to report a case of the use of zoledronate in active Paget’s disease. A 64 year old West Indian man with a 14 year history of polyostotic Paget’s disease (sites affected: skull, mandible, thoracolumbar spine, sacrum, pelvis, and left femur) was being regularly reviewed in the metabolic bone clinic. He had previously been treated at various times with injectable calcitonin (for six months), etidronate (for six months), tiludronate (for three months) and pamidronate (three courses: total doses 120, 60, and 240 mg), achieving variable symptomatic and biochemical responses. Recently his disease progressed and despite two further courses of intravenous pamidronate (total doses 120 mg and 180 mg) there was no major reduction of serum alkaline phosphatase (fig 1). Biochemical activity continued to rise and he began to complain of facial pain. On clinical examination there was no neurological deficit. He was given a single infusion of intravenous zoledronate 4 mg. There were no acute reactions or complications and calcium levels and renal function after infusion remained normal. 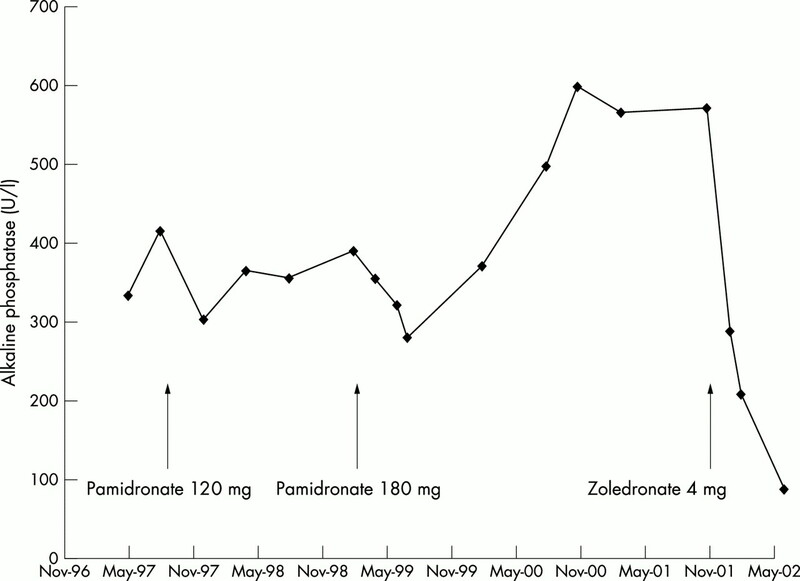 His symptoms improved over eight weeks and over a period of six months the alkaline phosphatase normalised, falling from 569 to 85 U/l (normal 30–130) (fig 1). Serum alkaline phosphatase levels over a period of five years. Normal range 30–130 U/l. Timing of bisphosphonate treatment shown by arrows. With a single infusion of zoledronate we were able to achieve clinical and biochemical remission in our patient with active Paget’s disease who had become resistant to pamidronate. Previous dose ranging studies, one of which was placebo controlled, have shown that single infusions of microgram amounts of zoledronate (up to 400 μg) inhibit bone resorption in patients with active Paget’s disease8,9 and, in addition, no detectable impairment of bone mineralisation has been found.10 The results of further studies examining the use of zoledronate in patients with metabolic bone disease are awaited with interest. Fleisch H. Bisphosphonates in bone disease from the laboratory to the patient. 2nd ed. London: Parthenon, 1995. Major PP, Coleman RE. Zoledronic acid in the treatment of hypercalcemia of malignancy: results of the international clinical development program. Semin Oncol2001;28(suppl 6):17–24. Reid IR, Brown JP, Burchardt P, Horowitz Z, Richardson P, Trechsel U, et al. Intravenous zoledronic acid in postmenopausal women with low bone mineral density. N Engl J Med2002;346:653–61. Cooper C, Schafheutle K, Dennison E, Kellingray S, Guyer P, Barker D. The epidemiology of Paget’s disease in Britain: is the prevalence decreasing? J Bone Miner Res1999;14:192–7. Grauer A, Bone H, McCloskey EV, McClung M, Gutteridge DH, Lyles KW, et al. Newer bisphosphonates in the treatment of Paget’s disease of bone: where we are and where we want to go. J Bone Miner Res1999;14(suppl 2):74–8. Altman RD. Long term follow up of therapy with intermittent etidronate disodium in Paget’s disease of bone. Am J Med1985;79:583–90. Gutteridge DH, Ward LC, Stewart GO, Retallack RW, Will RK, Prince RL, et al. Paget’s disease: acquired resistance to one aminobisphosphonate with retained response to another. J Bone Miner Res1999;14(suppl 2):79–84. Arden-Cordone M, Siris ES, Lyles KW, Knieriem A, Newton RA, Schaffer V, et al. Antiresorptive effect of a single infusion of microgram quantities of zoledronate in Paget’s disease of bone. Calcif Tissue Int1997;60:415–18. Buckler H, Fraser W, Hosking D, Ryan W, Maricic MJ, Singer, F et al. Single infusion of zoledronate in Paget’s disease of bone: a placebo-controlled, dose-ranging study. Bone1999;24(suppl):81–5S. Green JR, Muller K, Jaeggi KA. Preclinical pharmacology of CGP 42446, a new potent heterocyclic bisphosphonate compound. J Bone Miner Res1994;9:745–51.